Bar Crusher’s 490WR is one of the latest models from the Melbourne-based plate aluminium boat builder. While Fishing World has previously reviewed the 490C, a cuddy cabin style boat based on the same hull, I was looking forward to getting onboard the open configuration version for an extend length of time. 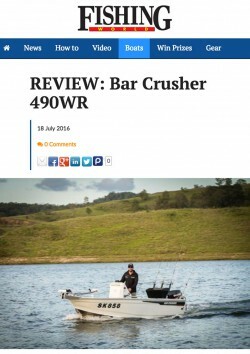 The team at Bar Crusher was kind enough to loan Fisho the new 490WR for several weeks and we sure made the most of it. During that time the 490WR was put through its paces in saltwater and the freshwater while fishing solo, two-up, three-up and even with a couple of kids onboard. This extended test gave us a genuine opportunity to determine whether the boat lived up to its reputation as a serious pint-size fishing machine. The 490WR basically looks like a smaller version of the larger Bar Crusher models. It’s constructed of heavy duty 4mm plate aluminium (hull) and 3mm plate aluminium (sides) and features extra-wide gunwales and tough checkerplate flooring. For this reason, it’s a unique boat and it feels overbuilt – in a good way. Having extensively used a similar-sized centre console fibreglass boat, I was keen to see the difference in performance and fishability. The first thing I noticed in the 490WR was the generous freeboard and wide gunwales while fishing. Even in rougher water I felt incredibly safe. Bar Crusher’s Waveslicer deep-V hull and Rigideck sub-floor structure provide the boat with a safe ride when conditions get rough. The 490WR also features a water ballast system called Quickflow, which floods the keel with water at rest and adds to to the stability. Given its excellent stability and aforementioned freeboard, it provides a snug feel at rest. Since Fisho’s last test on the 490C, Bar Crusher has installed a clever removable bait board/livewell at the transom. This was in response to the lack of built-in transom livewells as featured on Bar Crusher’s larger models. Given the 490WR’s small size, it can’t have every feature built-in, so the fellas at Bar Crusher did a good job adding this livewell to such a small and already feature-packed boat. Moving forward and there’s a deep ice chest which doubles as a seat and accommodates two people. I opted to use this area for watertight and lockable storage, although there is plenty of storage space elsewhere if you wanted to turn this into a functional kill tank. The top features a cushion and works well as a seat behind the console. The console is relatively low and allows an average-height driver to sit or stand. In calmer water I preferred to sit, and without a windscreen it gives a clear field of view at all angles. I prefer to stand in rougher water and around busy waterways, and this console makes it easy. There’s space on top to attach a large sounder and other accessories. The test boat featured a 5″ Raymarine Dragonfly combo, a capable unit and perfect for most applications in fresh and saltwater. If you wanted something bigger, you could easily go up to a 7″ or maybe 9″ unit. In front of the console there’s enough space to fish one person, or two people at a squeeze. There’s an elevated carpeted casting platform which features good storage underneath. The test boat also contained a second battery in this compartment to run the 12V Minn Kota trolling motor on the bow. Even with the battery mounted, there was plenty of space to store fishing gear under the casting platform. Most centre console boats are often lacking in storage. The 490WR, with its large ice box, casting platform, plus generous side pockets under the wide gunwales and at the transom, provides more than enough storage for a sub-5m boat. As mentioned, Bar Crusher mounted a 12V 55lb bow-mount Minn Kota electric motor. This came in handy chasing bass in freshwater, and bream, whiting and flathead in saltwater. It’s an option I could never live without and turns this boat into something truly versatile – for freshwater, estuary and inshore fishing. There’s no mistaking the 490WR as anything but a great fishing boat. It accommodates up to three anglers, and while I preferred to fish with two people onboard, we did have one productive session chasing kingfish on Sydney Harbour with three anglers without any problems. At one point I even broke out the fly rod and caught a few fish while the other two used lures up front. It’s a very versatile boat. Over the past month we fished everywhere from Sydney Heads to small saltwater creeks and large freshwater impoundments to freshwater rivers. Finding a boat capable of doing these things without too much compromise isn’t easy. The 490WR did it all surprisingly well. During a trip to Lake St Clair it was launched off the grassy bank. We fished into the night and early the following morning catching bass, under power of the electric motor. The smallish size of the 490WR made this finesse fishing easier and the tough construction of the boat had my mind at ease around all the hidden timber in the lake. Back in the saltwater and the 490WR handled itself surprisingly well in rougher conditions. While some salt spray is hard to avoid in all centre consoles, it was a relatively dry boat on the slop often experienced on Sydney Harbour. Back at home and it’s compact size and relatively light weight meant I could easily handle it solo and push it around the garage. That’s a big plus and meant more time fishing and less time stuffing around at home. The 490WR was fitted with a 60hp four-stroke Suzuki outboard. It’s a very quiet and fuel-efficient engine and really suited this boat without feeling over powered. Bar Crusher recommends engines between 40-70hp for this particular boat. If you enjoyed slightly more top end speed, a 70hp may work well. However, I found with a top speed just under 30kt, the 60hp was more than adequate. The 490WR features Bar Crusher’s latest Gen2 hull design, which includes a wider chine aft and the exclusive Delta Flare. According to the brochure, this design delivers more hydrodynamic lift for efficient planing, a dry ride and fuel efficiency… and on the water this really works! The transition from idle to plane is simple. It almost seems to glide onto the plane. This unique hull design, its light weight and the fuel efficiency of the four-stroke engine meant costs were kept to a minimum at the fuel bowser. While we didn’t have any gauges hooked up to accurately record fuel economy, anecdotal evidence suggests the 60L fuel capacity went a very long way. Over the course of several weeks, we put the 490WR through its paces and fished a variety of locations. It’s an impressive boat and really punches above its weight when it comes to performance and fishability. It performs like a much bigger boat – with the easy handling of a small one. If you’re in the market for a sub-5m open centre console boat without compromising on fishing features and sea worthiness, it’s well worth checking out the 490WR.